Microsoft rolled out another update for its Dynamics software, following the roadmap presented in April. This update, Dynamics GP 2016 R2 was designed to enhance business intelligence functionality, improve the GP Web Client, and implement top features requested by users. As we have done with prior updates (see GP 2016 New Features Part 1, Part 2, and Part 3), we will be compiling the features of the day into a series of blogs for the update, released December 1, 2016. So here it is, part one of the our new features in GP 2016 R2, highlighting 10 new features that will improve the experience and save time for Dynamics users. More control for payroll professionals, allowing W2’s to be printed in self-service, without using the pre-printed forms. Keeping track of fixed assets is easier than ever in Microsoft Dynamics GP 2016 R2. 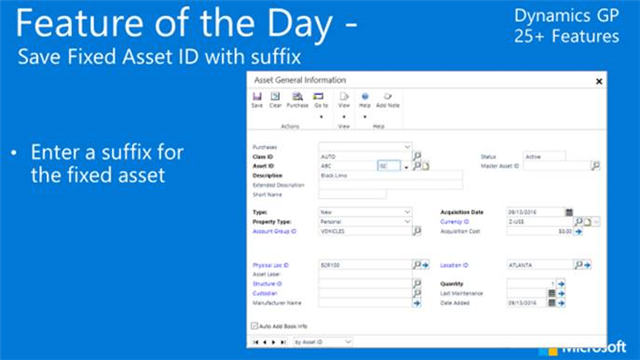 Announced on November 22, users can now enter a suffix for a fixed asset and save the fixed asset ID with a suffix. Bringing human resources and payroll closer together saves time, money, and can help reduce liability from the IRS and DOL regarding an employee’s time of service and FTE eligibility. 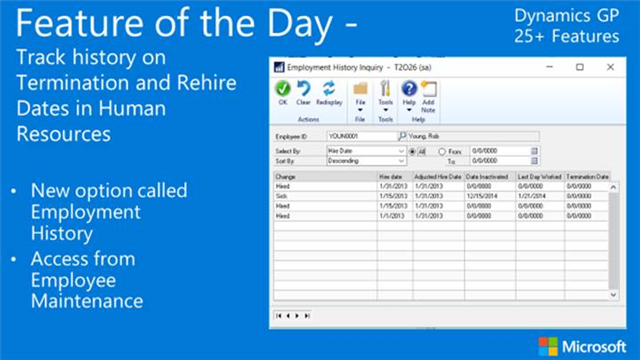 To make termination and rehiring an employee easier, Dynamics GP 2016 R2 now provides the ability to track termination and rehire dates. 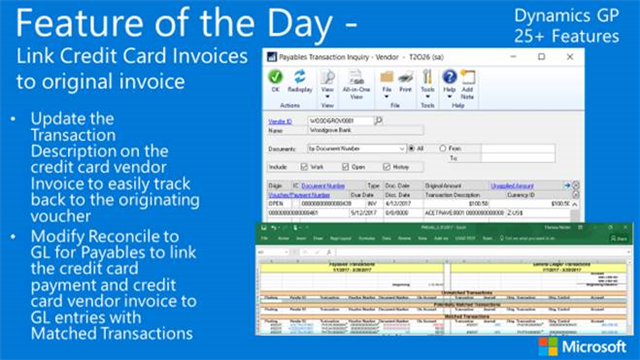 For project accounting, Microsoft Dynamics GP 2016 R2 improved upon this and the following feature. GP users will now be able to generate a report for timesheets, including a status report, a new report for part time employees, the ability to print timesheets by either status or by approver, and the ability to find who hasn’t turned in timesheets more easily than ever. 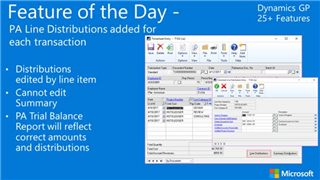 Additionally for the Project Accounting functionality, GP 2016 R2 simplifies distributions for users, adding the ability to edit distributions by line item. 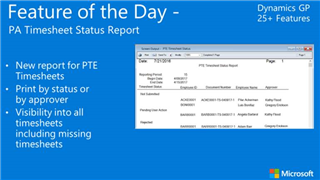 Management Reporter for Microsoft Dynamics ERP is an interactive reporting application that financial and business professionals can use to create, maintain, deploy, and view financial statements. It moves beyond traditional reporting constraints to help you design a variety of reports efficiently. Communication is stream-lined with the use of interactive notes and instant messaging. Immensely helpful to finance professionals, the reporting and communication platform includes dimension support, which means that account segments or dimensions are immediately available. There is no need for additional tools or configuration. 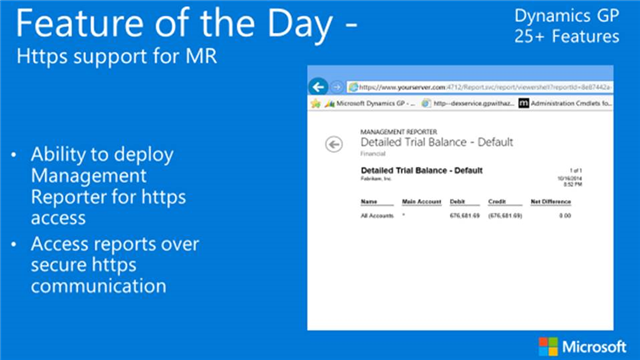 In Dynamics GP 2016 R2, Microsoft improved upon MR, providing the ability to deploy it for https access, providing increased security for users. PowerBI came onto the stage as a series of Excel add-ins which eventually came to be known as Power Pivot, Power View, Power Map and Power Query, Power BI began its life over two decades ago before becoming the iteration that was released as a cloud-hosted, freemium application in 2015. 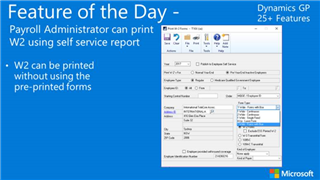 The set of applications evolved and has become embedded into all new 2016 Dynamics products. 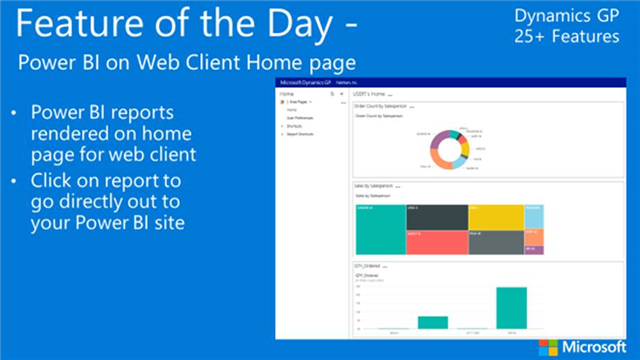 Now, Dynamics GP users have the ability to see PowerBI Reports on their homepage and can go directly to Power BI by clicking on the report. Tax rates are in a state of constant fluctuation. 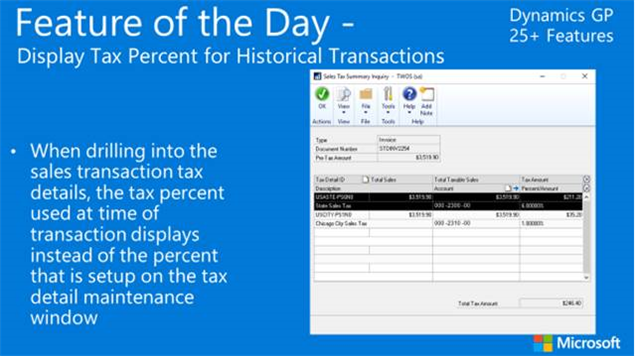 Knowing this, GP now provides the ability to see historical tax rates when drilling into the sales transaction tax details so that users can see taxes at time of transaction instead of the percent that is setup on the detail maintenance window. Designed to make reconciliation easier, a new feature allows users to link credit card invoices to the original invoice, providing the ability to easily track credit card transactions back to the originating voucher, improve matching, and ease reconciliation. 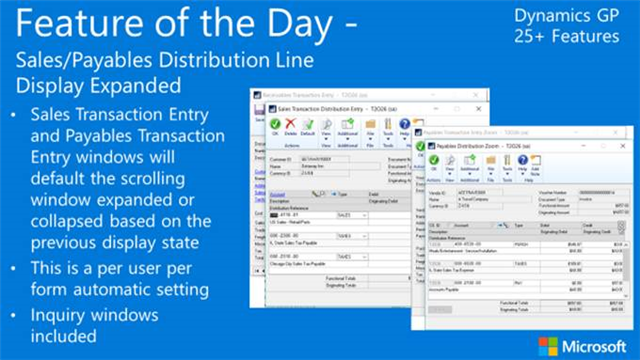 A new feature for sales and payables, the sales transaction entry and payables transaction entry windows will default, based on user preference, to expanded or collapsed based on the previous display state. 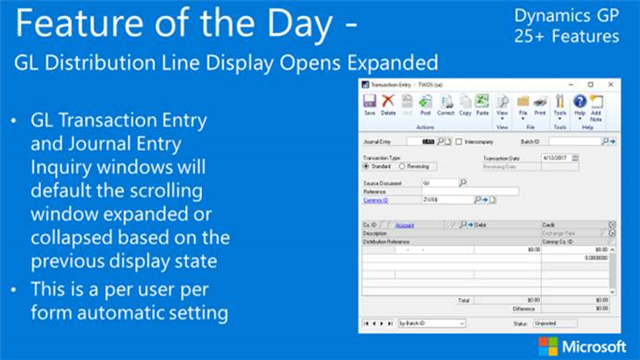 Another user interface enhancement similar to the aforementioned sales and payable distribution line, the GL transaction entry and journal entry inquiry windows will be expanded or collapsed based on the previous display state.